Nissan Teana Road Test: Hotel Teana! When Nissan left their luxury sedan Teana 250 XV for a road test with us, we thought this would be just another another CBU sedan. Sophisticated, comfortable… But that initial indifference began to change rapidly as the day went by. And its V6 heart had a lot to do with that! The first thing you notice about the Nissan Teana is its gigantic size and proportion. Move closer, and the mighty huge wrapround xenon headlamps greet you and the Nissan smiling chrome grill is quite imposing. The bonnet is large and wide, and you soon get used to the fact that everything on this car is Large. If you are in a hurry, scroll all the way down for a full photo gallery of the Nissan Teana. The rear angular tail lamps give a gentle soft touch to the rear. Doors are huge, and everything in the Teana oozes quality. This the top end XV variant runs on massive 17 inch alloys. The wing mirrors have the turn indicators. Mind you, the current Teana is the latest and has just received a major facelift – it surely looks much more attractive than the earlier one. 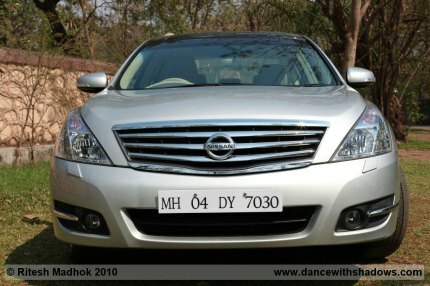 The older Nissan Teana was always rated highly for comfort and luxury and the latest one doesn’t disappoint us either. The bar is definitely raised higher! It is here that we realized why the company always uses the ‘hotel’ theme in the ad campaigns for the Teana. Everything is rich and laid out very well. Leather electric seats are well-cushioned, and both the front seats are also heated and cooled with adjustable memory setting for the drivers side. The Teana’s front passenger seat also has an electrically adjustable calf support, which when fully extended, and the seat-back set down, can convert this seat into a Business Class airline seat. Keyless entry and push button start are very convenient. The soft touch buttons on the dash and the huge glass roof allow in a lot of light and brighten the already bright interiors, and are very welcome. The instrument cluster is very sober and classy, and instrumentation is clear and readable. Quality is very high on the materials used in the interiors as well. Wood finish on the dash continues on the steering wheel – in this Nissan luxury saloon, however, unlike other cars the wood finish looks and feels very original. The rear seats of the Nissan Teana are one of the most comfortable we experienced so far and can put the best of sofas to shame. Shoulders, back and the thigh are perfectly supported. Noise is well-dampened, making the interiors very quiet. One grouse that we have is the steering, which is manually adjusted when everything else is electrical. Also the steering should have had a setting for reach, which we missed. Electrically operated rear windshield curtain also aids in cutting out the unwanted sunlight and glare at the rear. 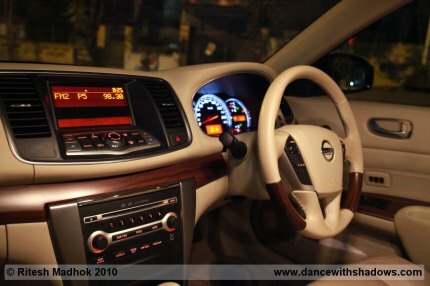 Overall, the interiors of the Nissan Teana are one of the best in this class. 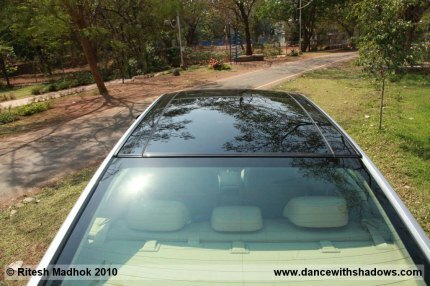 Photo: The all-glass roof of the Teana, with twin sunroofs. The unique attraction on the new Nissan Teana is the all-glass rooftop which incorporates a pair of sunroofs. Yes, you read that right – this car has two sunroofs on the all black glass roof and it further heightens the overall luxurious feel of the exterior. The bumpers, both rear and front, are massive in proportion and blend well with the design. The new Nissan Teana is powered by a 2500 cc V6 petrol engine as compared to the outgoing one which had a 2300cc. Pumping out 180 bhp and a meaty torque of 228 Nm at 4400 RPM, this engine is smooth and very refined. During the road test of the Teana, we felt that the CVT (Continuously Variable Transmission) manages to do a very decent job, but something was lacking. We would have loved a normal automatic with tiptronic or paddle shifts. We feel the CVT eats into the power a little bit. The transmission has a ‘Sports’ mode which helps when you want to go fast and the ratios start falling quickly. We would love to drive a Non CVT version if Nissan ever launches it in India. 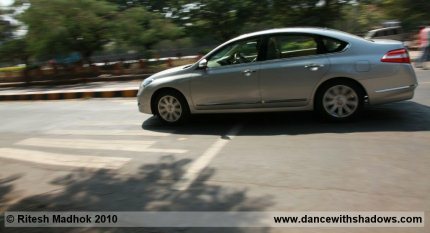 The top speed we managed in the Teana to achieve was an easy 165kmph. The car didn’t feel tired at that speed and could do much more – the speedo is calibrated to 260 kmph. The drive was nice and composed, and the car moves very sedately – remember that this is a luxury saloon and not a sports car. Handling is crisp, considering the huge proportions of this vehicle. Independent struts at the front and Multi – Link Independent suspension at the rear work wonderfully aided by the XXL wheels which conquer and filter out every pothole and bump. Power assisted 4- wheel anti-lock braking system (ABS),Electronic brake force distribution (EBD), Brake Assist (BA) work in tandem to bring this 1.5 ton biggie to a halt when needed. 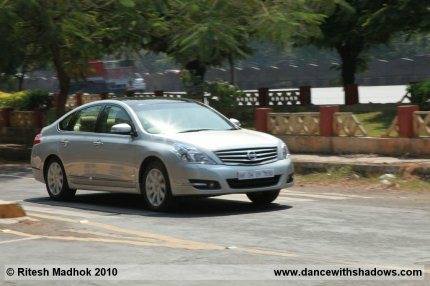 Switch off the VDC (Electronic Stability Program) and get into the sport mode and the naughty side of the Teana shines which should bring a smile to the wannabe rally drivers. Tank-full to tank-full, the fuel economy that we registered was in the region of 7 kmpl in city conditions and close to 10 kmpl on the highway, which is not bad for a luxury vehicle this big. Not that this matters much to the Teana buyer, we cannot have a road test without mentioning it, right? The Nissan Teana is definitely in the list for those who like being chauffeured around. 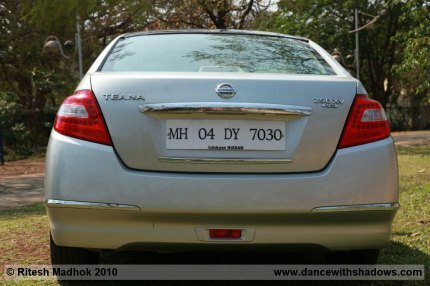 Sized much larger than the Mercedes C class and the BMW 3 series (both of which even cost a few lakhs more) the Teana boasts of roomy interiors, huge exteriors and a massive boot. With its rich interiors, best in its class sofa-like seats and superb ride are without doubt top of the line. Nissan has ensured the Teana is extremely well equipped. Unique features like the glass-top with twin sun roofs and the calf pads which convert the front passenger seat into an aircraft seat, those who want luxury and exclusivity need look no further – the Hotel Teana awaits you. 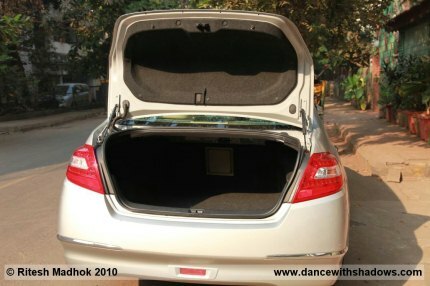 Parking sensors – considering this is a huge sedan by Indian standards. Absence of cooling duct in the glove box. Photo: Teana's XXL boot can swallow pretty much anything! Business class like front passenger seat with calf-rest. Nissan Teana Photo Gallery: Enjoy!